Western North Carolina’s Graham County is boarded by several large mountain ranges in the southwestern Blue Ridge Mountains. The Great Smoky Mountains to the north, the Snowbird Mountains to the southwest, the Unicoi Mountains to the west and the Nantahala Mountains to the southeast. The Cheoah Mountains lie throughout the center of the Graham County, a land of beauty and natural resource with both man-made and natural wonders. 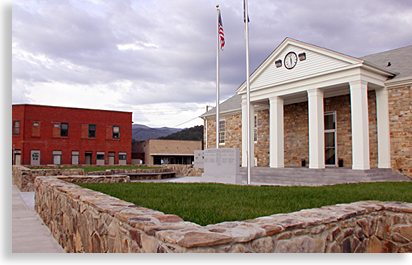 Robbinsville is the county seat and largest community in Graham County. Most claim Robbinsville was named after Senator James L. Robinson of Macon County North Carolina; some believed the name may have been derived from Mr. Robbins of Clay County, North Carolina who taught at the first school. Robbinsville was incorporated in 1883, the previous residents where the Cherokee dating back to the early 1500’s. One native resident was the Great Chief Junaluska leader of the Snowbird Clan of the Cherokee. He was given honor as the man who fought alongside President Andrew Jackson at the battle of Horseshoe Bend. Other Cherokee and Creek fought in the alongside the United States Government as well against a separate band of the Creek Nation called the “Red Sticks”. In 1838 Chief Junaluska and all the Cherokee People the U.S. Government could round up in the Blue Ridge Mountain region were subjected to removal from their homelands and forced west along what became the “Trail of Tears,” to a reservation in Oklahoma. Nearly 2,000 Cherokee died during the exodus. Years later Chief Junaluska left Oklahoma and walked all the way back to the Snowbird Mountains of Graham County. For his feat and obvious devotion to his people’s homeland he was given 337 acres and made a citizen of Graham County. 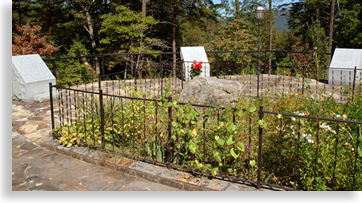 At his grave site you will find his memorial and museum, the memorial has a special feature called the Medicine Trail. The trail follows a path through the forest where you will find the natural plant life found in his mountain homeland, many of these plants display markers describing the medicinal and healing values they possess. At the heart of the Graham County is Santeetlah Lake, constructed in 1928 to be used as a water storage facility to support hydroelectric-generation. The lake seems almost remote, out of view from the main county highway, tucked away in the center of the county yet easily accessible by route 129. This beautiful lake with mountains rising all around has 76-miles of shoreline, perfect for bass fishing and recreational boating. The lake also includes a beach front great for the kids and the whole family. Santeetlah Lake fishing includes large and small-mouth bass, lake trout, walleye, crappie and bream. Boarding the northeastern end of Graham County is the popular Fontana Lake and Dam. Fontana Lake has 238 miles of shoreline with 10,230 acres of water surface, great for mountain-lake recreation, boating, fishing and swimming. Camping, picnics, horseback riding, mountain biking and 39 miles of trails winding along the lake provide fun and recreation to the many visitors who visit Fontana Lake and Dam each year. Fontana Dam, part of the Tennessee Valley Authority’s watershed system stands at 480 feet, the dam was constructed between 1942 and 1944 and is the tallest dam east of the Rocky Mountains. The dam holds back the waters of the Little Tennessee River along with several other mountain rivers in the region like the Nantahala, Tuskegee and Oconaluftee Rivers and numerous creeks and streams all contained in the waters of Fontana Lake. The dam serves as a hydro-power plant to generate electricity to create aluminum necessary for the war effort. Electricity is still produced here and the dam serves as part of a flood control system for the interior mountain valleys and the Tennessee River Valley to the west of the Blue Ridge Mountains. Located along the southeastern shoreline of Fontana Lake is the Tsali Recreational Area, known as a Mecca for hiking, mountain biking and horseback riding along with other outdoor sporting. Tsali is the name of a Cherokee leader who along with one of his sons and brother-in-law gave up their lives due to a unfortunate incident between them and federal soldiers. Their execution relieved the pressure the United States Army was putting on the remainder of the Cherokee People who fled from forced removal during the time of the Trail of Tears. After their act of sacrifice the U. S. Army pretty much left the remaining Cherokee People in the area alone. Along the northern shoreline of Fontana Lake and beyond is the Great Smoky Mountain National Park an 800-square-mile biological preserve, which spans Graham County’s northern horizon from North Carolina into Eastern Tennessee. If you are looking for Scenic Driving Tours, you’ll find several including just about anywhere you drive in Graham County. There is beauty at almost every turn. The Dragon skirts the northwestern boundary of Graham County. This 11-mile stretch of highway is considered by many to be one of the world’s best motorcycling and sports car roads that you’ll find in the Eastern United States. 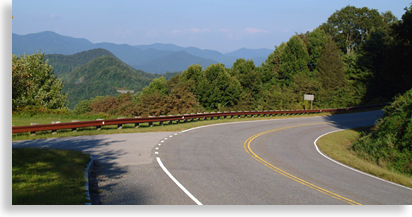 This section of U.S. 129 acquired its name “The Dragon” from the 318 tight curves that officially begins or ends when you cross Deals Gap at the Tennessee - North Carolina state line. If you’re looking for fellowship with other biking enthusiast this run is legendary. Bordering the north side of the Dragon’s Tail is the Great Smoky Mountains National Park, the southern line of the road rolls along a dense forested area owned by Alcoa Aluminum. A corridor of trees line both sides of the road, beautiful in the fall and mysterious looking after a late spring or summer rain when mist rises off the pavement by the rays of sunlight showering through the trees. Many of the roadrunners like to begin their journey along the the Dragon a few miles up the road at the Cheoah Dam or Fontana Dam in Graham County. The Dragon ends at Tabcat Creek in Tennessee just above the entrance to the Foothills Parkway another impressive scenic byway. If the Dragon wets your appetite for road adventure then your going to want to take a journey through Graham County’s Unicoi (Unaka) Mountains. Here you will traverse the sky country of the southwestern Blue Ridge Mountain Province on the Cherohala Skyway. Once a Native American trading route before it became a wagon train road for early settlers, this fifty-two mile state of the art road scrapes the sky at its peak of 5,390 feet. Hiking trails, picnic areas, creeks and waterfalls are accessible from the road and the vistas are well worth the journey. The Cherohala Skyway opened to the public in 1996 at a cost of $100 million, taking 30 years to build. The views are stupendous rivaling the Blue Ridge Parkway. Other than just for the sake of beauty the road was constructed to connect the mountain towns of Robbinsville, Graham County North Carolina with Tellico Plains, Monroe County Tennessee. The late 1800’s and early 1900’s were a time when the demand for lumber had profiteers hungry for the harvest of trees, this old growth forest in the remote mountains of the Blue Ridge wet their appetites. A great deal of these mountains where stripped of their valuable trees, only a few holdouts of old growth forests that were difficult to access, still remain in the Blue Ridge Mountains. 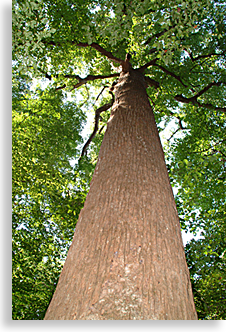 Within this memorials 3,800 acre preserve are trees considered to be 400 years old, standing as high as 150 feet tall with circumferences of 20 feet. The poet’s name has served the Veterans of Foreign Wars as a fitting tribute to this memorial preserve. Joyce Kilmer, poet and author was killed in action during World War I. Another great scenic drive cuts a line through the southeastern border of Graham County, the Nantahala River Gorge featuring a beautiful white water river in the depths of an American rainforest. The Nantahala River carves its path through the floor of the gorge along highway 74/19 and is a favorite for white water rafting, kayaking, canoeing, fun-yaks and slalom enthusiast. Eight miles of the Nantahala River is used for commercial rafting with local outfitters filling the needs of white water adventurers. The Upper Nantahala River Gorge above the powerhouse is ideal for fly-fishing. A paved road follows the narrow gorge alongside the river where great views of whitewater cascading over several waterfalls along with other falls showering down the gorge's steep walls. Between the last two sets of big falls on the right side of the route is an unpaved forestry leading to a camping area, if you enjoy waterfalls continue on the forestry road there’s more falls to come all can be sighted from your vehicle. Rafting is not safe along this course of the Upper Nantahala River, leaving the beauty and serenity to sightseers and fishing sports-persons alike. Bordering the eastern line of Graham County and traveling through the very heart of the county is the Indian Lakes Scenic Byway. The scenic byway takes you along several overlooks of both Fontana Lake and Santeetlah Lake and through the remote mountain community of Stecoah, and picturesque mountain valley that has remainder nearly unchanged for 100 years. Connecting the southern and northern reaches of Graham is the world famous Appalachian Trail. The Appalachian Trail begins in the North Georgia Mountains and ends in the state of Maine, an over 2,00 mile primitive hiking trail. Twenty-nine miles of the Appalachian Trail pass through Graham County crossing the Nantahala River at Wesser in the south, climbing 5,062 feet at Cheoah Bald then traveling north over the high ridges of the Cheoah Mountains. The trail crosses Fontana Dam along the northern end of Graham Country, from there the Appalachian Trail transverses the entire backbone of the Great Smoky Mountains National Park. For the backcountry adventurer there are the Snowbird Mountains in the southwestern reaches of Graham County. Steep and rugged, remote and beautiful, the perfect mix for an outdoor experience to those with a passion for the wilderness backpacking. On the map Graham County seems out of place, too deep to reach, beyond the imagination of possibilities, but that’s what makes it a jewel in the rough. Graham County’s geographical configuration of mountains, rivers, lakes and valleys has it all with plenty left over. From leisurely mountain drives to hardy hikes, water recreation to great dining, lodging, mountain crafts, live folk entertainment, history and more making Graham County a must for your Blue Ridge Mountain or Smoky Mountain Highlander getaway experience.